sign-up to our newsletter to receive announcements. Limited offer, get a 15% off coupon code, insert your email below. *We guarantee 100% privacy. Your information will not be shared. Optimization of the gateway's core mechanisms. The latest update brings a new feature that allows users to set full permissions on gateway directories. A new update for SiteVault has been released containing improvements for FTP transfers and accessing backup listings. Your Joomla website is in danger all the time due to hackers, hardware failures or corupted databases! In order to keep it safe you must always have your Joomla database and files backed up and ready for restore. This should help you if something bad happens or if you want to move your site from one server to another in case of changing hosting services. You can do backups of your Joomla site DB and files very easily using Site-Vault, and the process can be completely automated, just schedule it and let it run. Why backup your Joomla site with Site-Vault? Your website content costs a lot more than $39! 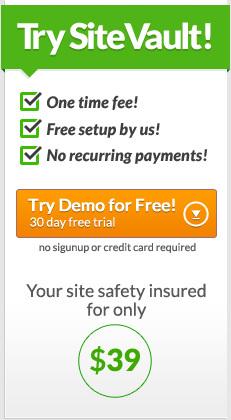 Very fast and easy to restore your site! Have your site backed up in minutes! Very simple setup in just few steps! Below you'll find a step-by-step tutorial on how to backup your Joomla website and restore it in case of a data-loss disaster. 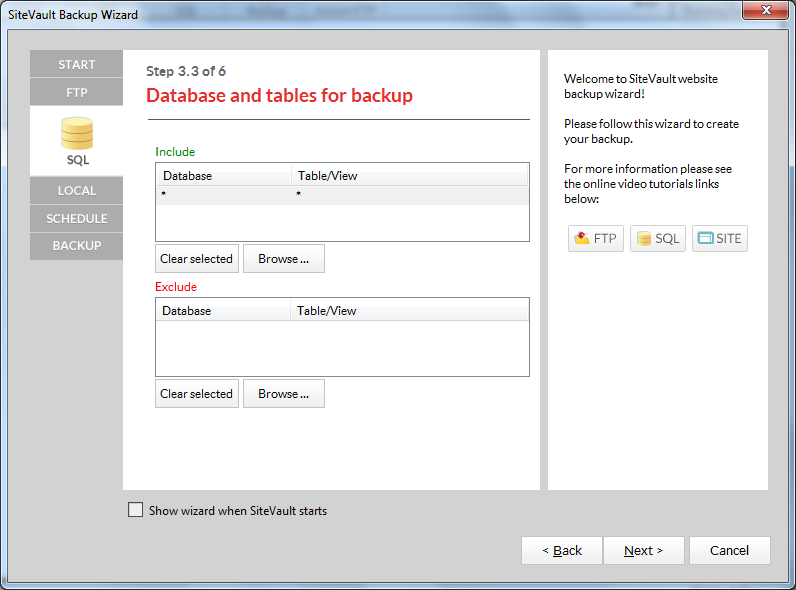 If you have not left ticked "Show wizard when SiteVault starts" select File -> Backup Wizard. In the window that appears fill in the website address that you want to backup as well as a meaningful name, if you have more sites, to be able to recognize it easily. If this is your first time making a backup of joomla, you need to setup an FTP account that you will use to backup the files on the server. To create a new FTP account select "No, I want to set up a FTP/SFTP/FTPS account now." If you already have an account select "Yes, I already set up a FTP/SFTP/FTPS account" and choose the account created to connect to your joomla installation. If you do not want to backup the files, only the records in the database select the option "Skip FTP/SFTP/FTPS backup" and move to Sql backup. If you already have an FTP/SFTP/FTPS account created and you wish to use that one proceed to the next step. Fill in the field "Caption" with a meaningful name for your FTP, to easily identify this account. In the field "Host" fill the server name or IP address. If the server accepts FTP/SFTP/FTPS connections on a different port than the default uncheck "Use default port" and enter the port used in the field "Port". Enter the username and password you use to connect to the FTP server. You can select multiple folders by clicking the check boxes from the Include column in the popup. You can also exclude from backup subfolders of selected folders; in order to do this click the checkboxes from the "Exclude column" in the popup window that appears. SiteVaultPro can copy files using a PHP gateway. This method increases the speed of the file transfer considerably. SiteVault will upload the PHP gateway automatically. You have to specify the equivalence between the FTP path and HTTP path (for example, if your site is located in the /public_html folder, the FTP path will be "/public_html" and the HTTP path "http://www.your-site.com"). 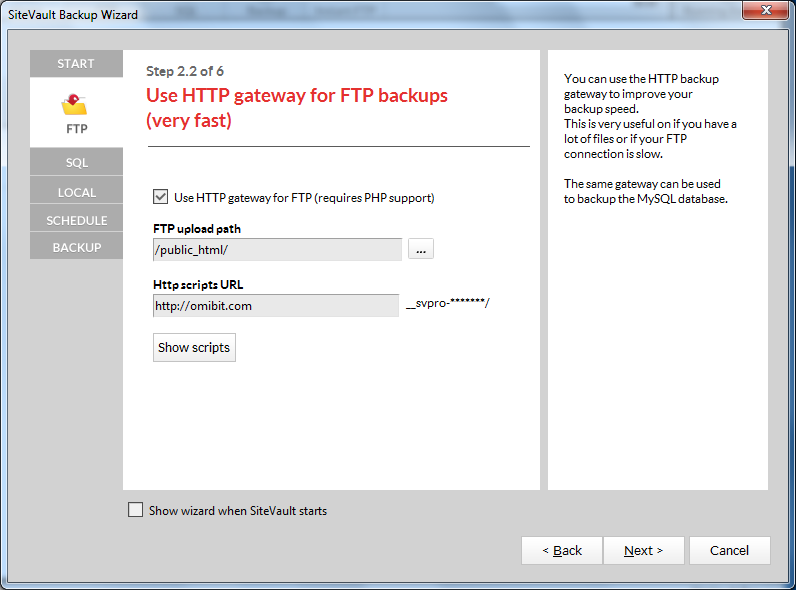 You can choose not to use the gateway by unchecking "Use HTTP gateway for FTP". If this is your first time making a backup to joomla, you need to setup an SQL account that will be used to backup the database. 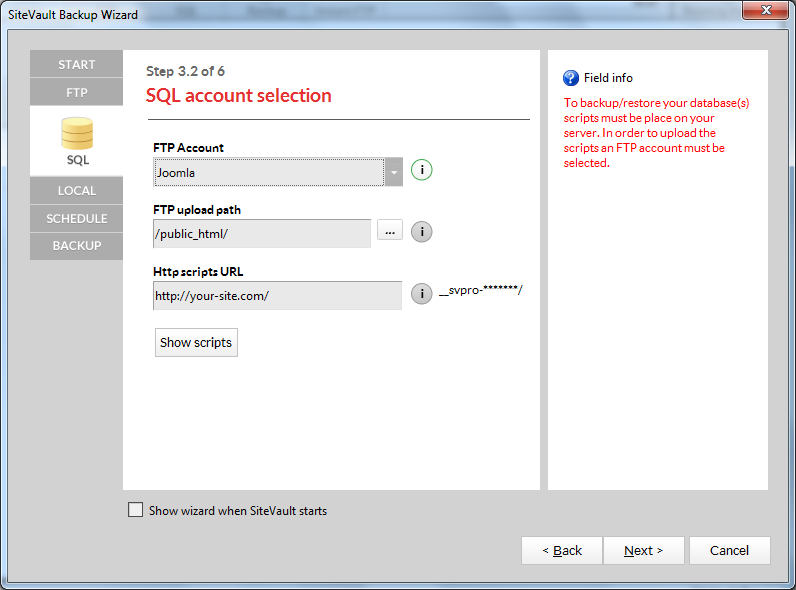 To create a new SQL account select "No, I want to set up an SQL account now". 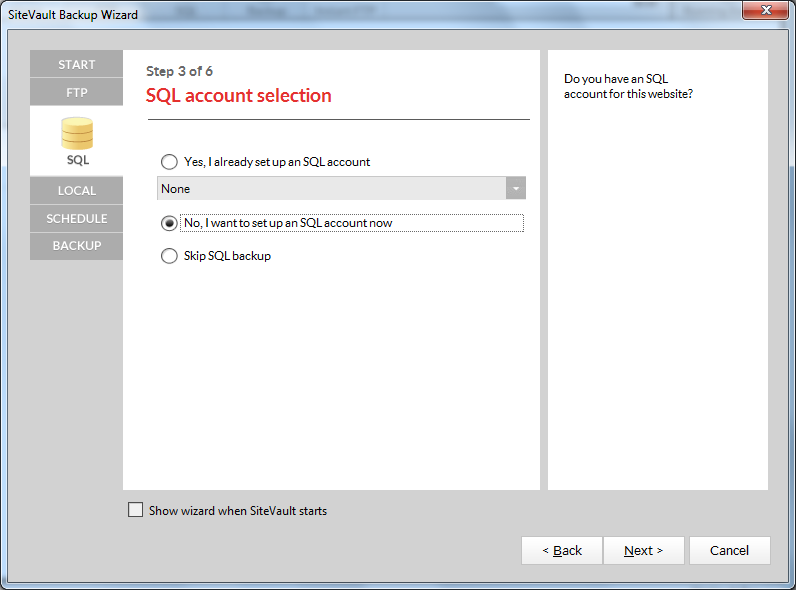 If you already have an account select "Yes, I already set up an SQL account" and choose the account created to connect to the database. If you do not want to backup the database select the option "Skip SQL backup" and move to the next step. 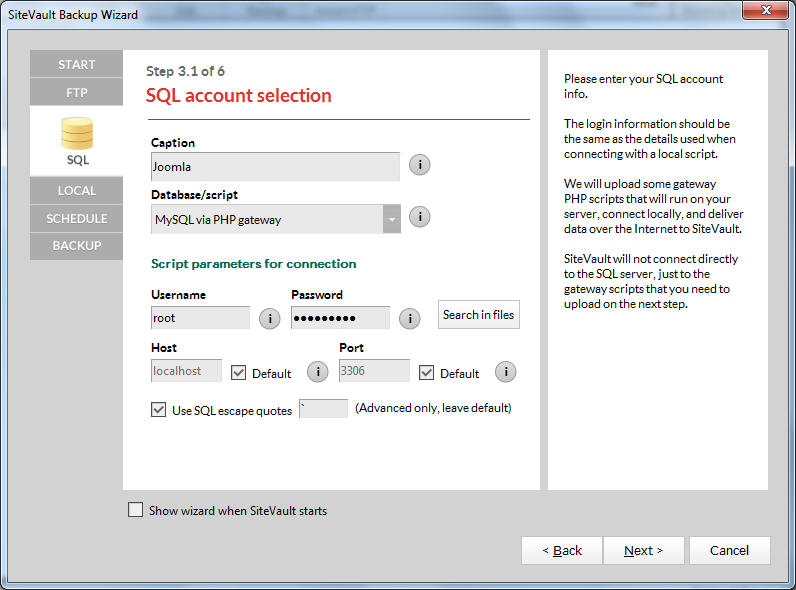 If you already have an SQL account that you would like to use proceed to the next step. Fill in the field "Caption" with a meaningful name for your SQL, to easily identify	this account. In the field "Database / script" select the type of database used, and that type of scripts recognized by the server. In the fields "Username" and "Password" enter the username and password used for connecting to the database. The database name and login data are found in the root directory of your installation, in the configuration file with the default name "configuration.php". Open this file by pressing "Search in files" button and selecting the file or with any text editor and copy from there the required values for Username and Password. If you you use a different host and port than the default enter these values in the fields "Host" and "Port". Leave checked the option "Use SQL escape quotes" and select the type of character encoding used in database if it is different than the default one. To backup the database SiteVaultPro needs to upload some script files to the server that will connect to the database and save your data. Change the FTP account if needed. In the field "FTP upload path" fill (or select) the folder where you want the files to be uploaded (you can browse for the folder by clicking the "Browse" button next to the field). In field "HTTP scripts URL" fill in the http path to the files uploaded, as shown int the image. SiteVaultPro will try to fill in the paths automatically. Please check if they are correct and make sure to change them is needed. Click on the "Show scripts" to view the files that will be uploaded and will act as a gateway. Click on "Next" to upload these files on the server before moving to next step. Select the databases and tables you want to backup by clicking "Browse". You can choose to exclude tables and databases from the backup or you can exclude a table from an included backup. Click on "Browse" and thick the check boxes in the "Include" and "Exclude" columns. Leave the option "Schedule a backup for this website" checked to automate the backup process and select the frequency of the backups. If you do not want to automate the backup process uncheck this option. If you want to do a backup now leave checked "Backup your website now" and then click Finish. If you would like to be notified each time the backup runs and receive a complete report fill in your e-mail address in the field "Notify e-mail". If you'll use Site-Vault and follow these steps you should have your Joomla database safely backed up on your computer. Bonus tip: you can sign up for our affiliate program to promote Site-Vault and because of the very generous commission of 60% we offer you can recover your initial investement after only two sales. Download FAQs Support Privacy Terms © 2019 Amorphys Romania. All rights reserved.